Harry Winks's last-gasp header gave Tottenham a 2-1 win at Fulham on Super Sunday, but how did they cope without the injured Harry Kane? Fernando Llorente was tasked with filling in for the injured Harry Kane, but he will not look back on his first Premier League start of the season fondly. He did have the ball in the net after 17 minutes, but unfortunately it was the wrong one. His own goal set the tone for a disappointing performance at Craven Cottage. "He never seemed to get over it," said Sky Sports pundit Jamie Redknapp. With his confidence hit, Llorente went on to miss a string of opportunities. The first came barely five minutes after his own goal when he headed an inviting cross into his own shoulder, allowing Sergio Rico to make a straightforward save. There was another head-in-hands moment when he nodded Danny Rose's free-kick wide from six yards out in the closing stages. Winks' winner ensured Llorente's profligacy did not prove costly, but his all-round play was concerning, too. Kane is key to Spurs for his build-up play as well as his goals, but Llorente offered little in that regard. His passing accuracy of 39 per cent was the lowest on the pitch and a considerable drop on Kane's 73 per cent average. Spurs will hope Llorente benefits from his first 90 minutes in the Premier League this season, especially with Heung-Min Son away on international duty and Dele Alli, the scorer of their equaliser, joining Kane on the treatment table with what looked like a hamstring injury. With no transfers expected before the end of the window, and with untested youngster Kazaiah Sterling their only other option up front, Spurs certainly need the Spaniard to find form sooner rather than later. "His touch wasn't right and he looked like a player who hadn't played a lot of football," added Redknapp. "But unless you get someone else in, you've got to give him another chance. "He's not a bad player. He's got good pedigree. He's been at Juventus, he's been at Bilbao, where everyone wanted him. He just looks like a player who needs to get some game-time under his belt and get his confidence back, because that own goal was a nasty moment for him." Graeme Souness added: "They haven't got a similar type of player to Harry Kane with that kind of movement and energy. [Llorente] is the kind of player you throw on - as they did against Manchester United - when you are chasing the game and you go more direct. It's double-difficult to go out and spend money at this time, so they might just have to live with him." Tottenham attempted their highest total of crosses in any Premier League game all season (32) in a bid to play to Llorente's strengths, but it was the 5ft 8ins Winks who headed the winner. It was his first goal since November 2016 and he could not have timed it any better. With Victor Wanyama injured and Mousa Dembele also unavailable for much of the season before his recent departure to China, Winks has quietly become a key figure for Spurs this season. And with four months still to play, the 22-year-old has already made more Premier League starts than in any of his previous seasons with his boyhood club. Winks' goal was superbly-taken but he was impressive throughout, pulling the strings in midfield with his usual composure. Over the course of the 90 minutes, he attempted 102 passes - the most on the pitch - and registered an 89 per cent accuracy rate. Seventy-two of his passes came in Fulham's half, underlining his importance to Tottenham's attacking play. Winks' influence is not always obvious - he is the kind of player who plays the pass before the pass - but he was as impressive without the ball as he was with it. According to Opta, he won possession 11 times in total - three more than any other player on the pitch. That determination helped Spurs dominate possession from start to finish. Indeed, it was typical of his performance that Winks started the move which led to the winner himself. 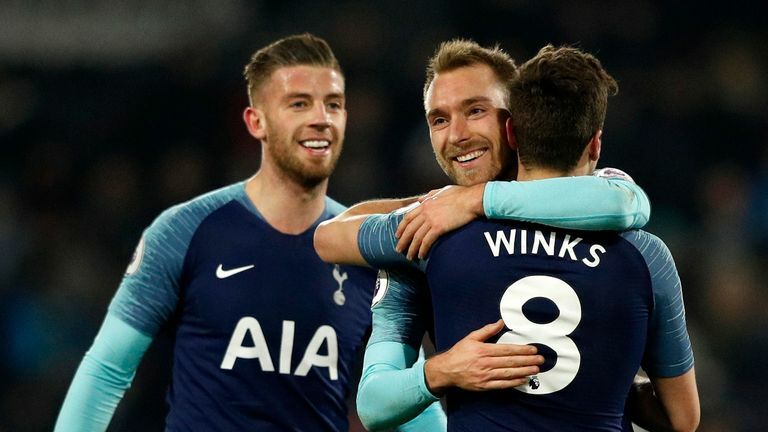 "I think the action was brilliant because after nearly 93 minutes, Harry Winks recovered the ball in a deeper position, at right full-back, and then we start to build from the back," Mauricio Pochettino told Sky Sports. "The cross was fantastic from [Georges-Kevin] N'Koudou and he arrived with the determination to score. That is the belief and the faith that we love to see."